Home » Introducing Chef Lilly! 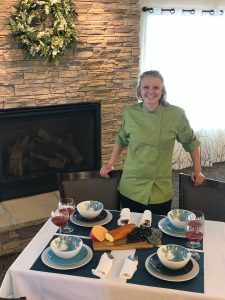 Regency Manor is excited to introduce Chef Lilly Stancil. Lilly is from Belleville IL. Went to Belleville West High School and Le Cordon Bleu in St Peters. She began her culinary career at Ruth’s Chris Steakhouse as a Pastry Chef and worked her way up to Sous Chef. Lilly loves outdoor adventures and spending time with her family. Regency Manor would love to answer any questions you might have about our dining services! Contact Jan Brenner -Executive Director for a sample menu today!! visit www.manor55.com or call 618-726-2240.